OUR FIRST impression, after a brief spell of riding the Rambler, is that it is a match for anything in its class. During an official off-road riding session we sneaked an opportunity to try the machine on Tarmac as well as grass and discovered the single cylinder two stroke would rev freely through the 7,500 rpm red line in all five gears. What made the performance even more impressive was the fact that the test bike we rode was not even run in. The engine and gearbox are standard Yamaha units NVT neither make, nor need any excuse for using without modification. On paper the gear ratios appear to be far too widely spaced with, for example, the first cog rated at 30.93:1 and the second at 20.44:1. 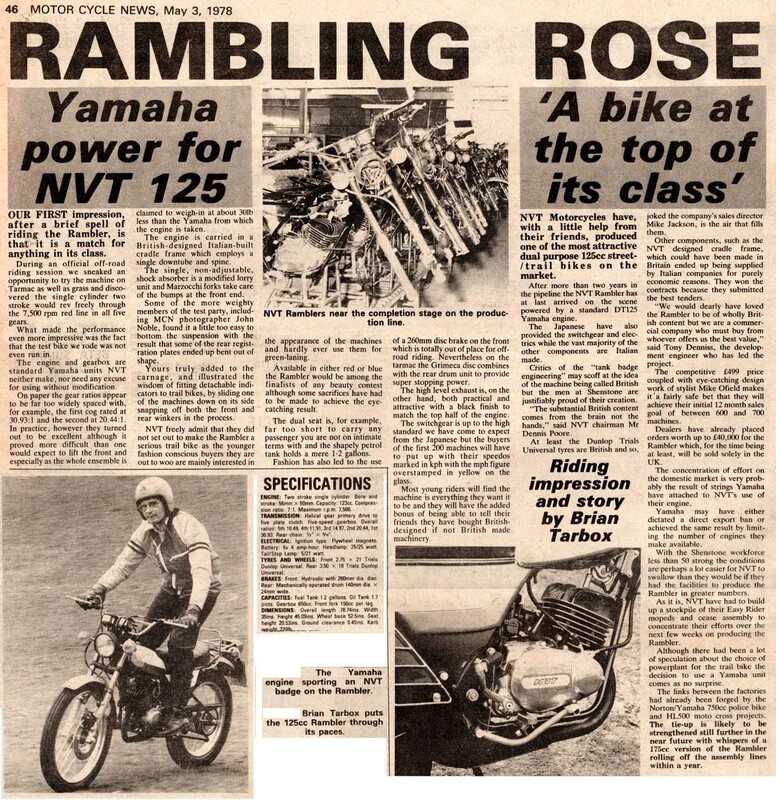 In practice, however they turned out to be excellent although it proved more difficult than one would expect to lift the front and especially as the whole ensemble is claimed to weigh-in at about 30lb less than the Yamaha from which the engine is taken. The engine is carried in a British-designed Italian-built cradle frame which employs a single downtube and spine. The single, non-adjustable, shock absorber is a modified lorry unit and Marzocchi forks take care of the bumps at the front end. 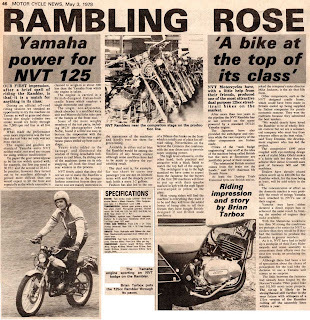 Some of the more weighty members of the test party, including MCN photographer John Noble, found it a little too easy to bottom the suspension with the result that some of the rear registration plates ended up bent out of shape. Yours truly added to the carnage, and illustrated the wisdom of fitting detachable indicators to trail bikes, by sliding one of the machines down on its side snapping off both the front and rear winkers in the process. NVT freely admit that they did not set out to make the Rambler a serious trail bike as the younger fashion conscious buyers they are out to woo are mainly interested in the appearance of the machines and hardly ever use them for green-laning. Available in either red or blue the Rambler would be among the finalists of any beauty contest although some sacrifices have had to be made to achieve the eye-catching result. The dual seat is, for example, far too short to carry any passenger you are not on intimate terms with and the shapely petrol tank holds a mere 1-2 gallons. Fashion has also led to the use of a 260mm disc brake on the front which is totally out of place for off-road riding. Nevertheless on the tarmac the Grimeca disc combines with the rear drum unit to provide super stopping power. The high level exhaust is, on the other hand, both practical and attractive with a black finish to match the top half of the engine. The switchgear is up to the high standard we have come to expect from the Japanese but the buyers of the first 200 machines will have to put up with their speedos marked in kph with the mph figure overstamped in yellow on the glass. Most young riders will find the machine is everything they want it to be and they will have the added bonus of being able to tell their friends they have bought British-designed if not British made machinery. NVT Motorcycles have, with a little help from their friends, produced one of the most attractive dual purpose 125cc street-trail bikes on the market. After more than two years in the pipeline the NVT Rambler has at last arrived on the scene powered by a standard DT125 Yamaha engine. The Japanese have also provided the switchgear and electrics while the vast majority of the other components are Italian made. Critics of the "tank badge engineering" may scoff at the idea of the machine being called British but the men at Shenstone are justifiably proud of their creation. At least the Dunlop Trials Universal tyres are British and so, joked the company’s sales directorMike Jackson, is the air that fills them. Other components, such as the NVT designed cradle frame, which could have been made in Britain ended up being supplied by Italian companies for purely economic reasons. They won the contracts because they submitted the best tenders. "We would dearly have loved the Rambler to be of wholly British content but we are a commercial company who must buy from whoever offers us the best value," said Tony Denniss, the development engineer who has led the project. The competitive £499 price coupled with eye-catching design work of stylist Mike Ofield makes it a fairly safe bet that they will achieve their initial 12 month sales goal of between 600 and 700 machines. Dealers have already placed orders worth up to £40,000 for the Rambler which, for the time being at least, will be sold solely in the UK. The concentration of effort on the domestic market is very probably the result of strings Yamaha have attached to NVTs use of their engine. Yamaha may have either dictated a direct export ban or achieved the same result by limiting the number of engines they make available. With the Shenstone workforce less than 50 strong the conditions are perhaps a lot easier for NVT to swallow than they would be if they had the facilities to produce the Rambler in greater numbers. As it is, NVT have had to build up a stockpile of their Easy Rider mopeds and cease assembly to concentrate their efforts over the next few weeks on producing the Rambler. Although there had been a lot of speculation about the choice of powerplant for the trail bike the decision to use a Yamaha unit comes as no surprise. The links between the factories had already been forged by the Norton/Yamaha 750cc police bike and HL500 moto cross projects. The tie-up is likely to be strengthened still further in the near future with whispers of a 175cc version of the Rambler rolling off the assembly lines within a year.